The striped bass fishing in Mass Bay waters is nothing short of remarkable. Anglers travel here for the variety of fishing options, the number of fish available and the size of fish caught. In 2009 our largest fish was 54 lbs. We have access to a remarkable number of different venues to pursue this great gamefish. Early season finds us fishing predominantly in the estuaries and tidal salt rivers around Cape Ann. As the season progresses we will take anglers along our scenic barrier beaches and into the surf zone along the rocky shoreline. “Pocket Fishing” as we call it involves putting the boat close enough to the rocks so anglers can cast lures and flies close enough to hit the rocks. Striped bass prefer this surf zone and you need to be tight to hook up. This is a challenging place to fish and an exciting and rewarding way to fish. Early and late season will often find us fishing under birds to feeding schools of fish. We have tremendous amounts of bait native to our area and as a result a significant number of bass stop by Cape Ann to feed while migrating as well as to set up residence for the summer. We use fly rods and light spinning gear for our striped bass trips. We feature top of the line Orvis equipment for all fly anglers using rods as light as 5wt early in the season and as heavy as 10 wt later in the summer. Our spinning gear is usually 8-10 lb Penn gear early in May and June and then 12-15lb as the big fish appear in greater numbers. We use plastics and poppers as our preferred lures and weighted flies such as clousers or sliders and poppers for our fly fishing clientele. The first Striped Bass of the year arrive in late April. We will be inundated with fish by mid-May with some of our best fishing of the year occurring during May. With June comes an influx of large fish and big school of Bait. July can be good but our next peak is during August and September. 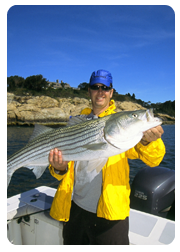 Striped bass can be caught until late October during most years.